In Robert’s latest work individual colors are defined as ‘genetic sequences’, realized digitally as a string of 1s and 0s. 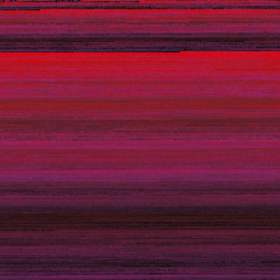 Each is a kind of ‘creature’, encoded by a binary DNA, but then expressed as the usual RGB or HSV colormap values. Because of this representation, colors can be mutated and crossed with each other within the computer to form new variations. Oversized pixels, rastered onto the image plane, are used to record these colors as they are created. Visualizing these operations shows how richness and complexity can emerge from simple processes iterated to a massive scale. The potential of the purely computational, the mechanistic, is explored as it approaches the boundary with the natural, the tactile, the ‘real’. Each series investigates a different combination of techniques, rendered for effect. The pieces are randomly seeded, and are a unique result from the process they express. They are titled by their ‘Unix timestamp’ – the exact time of creation recorded as the number of milliseconds since 00:00:00 UTC 1st January 1970. Join us for Art by Code to check out Robert Allison’s latest work.